The CONICET invested ARS $3,500,000 in a new biotechnology plant. In the city of San Miguel de Tucumán, through videoconferencing, President Cristina Fernández de Kirchner inaugurated the Biotechnology Plant for Good Manufacturing Practice of the Pilot Plant of Industrial and Biological Processes (PROIMI) under the scope of the National Scientific and Technical Research Council (CONICET). The event was held at the institute and it was hosted by Dr. Roberto Salverzza, president of the Council; and Dr. Lucía Castellanos de Figueroa, director of the PROIMI. The plant produces microbiological fermentations for the development of food and pharmaceutical products. 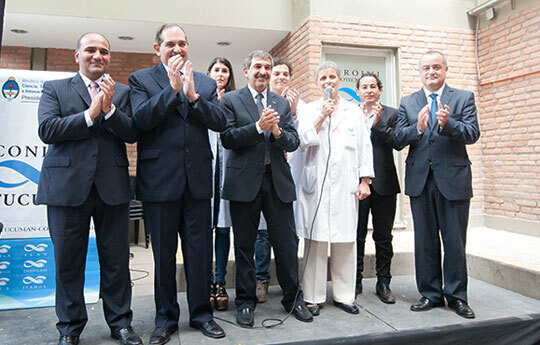 For Dr. Salvarezza, “thanks to the investment of the national government; the PROIMI is one of the best institutes of the CONICET in the province”. He also added that in spite of the fact that the institute has always focused on microbial biotechnology, “now, they have the possibility to produce. We are opening a complete plant for good manufacturing practices where it is possible to work under international standards. We make a virtuous circle: from the laboratory to the production”. Furthermore, the president of the Council highlighted the commitment of the researchers, technicians, fellows and administrative staff “who work very hard to improve Argentine science”. For her part, Dr. Castellanos affirmed that “the plant can produce consumables and provide validation services. The idea is to transfer the scientific knowledge generated at the institute”. Besides, the director commented that the PROIMI has the only 1500-liter fermenter in the country, both at a public and private level. At the end of the videoconferencing, the Argentine President said “It is a source of national pride to have young people devoted to science, technology, and research into biotechnology, engineering and chemistry. This will promote the development of our most important niche in terms of research and development”. Furthermore, she added that “since 2003, science and technology have become some of the mainstays of state investment and public policy”. Financed by the CONICET, the work cost ARS$ 3,500,000. It has an area of 350 m2 and quality control rooms; downflow booths; utility and sterilization of soiled material rooms; media preparation, clean bench, bio freezer, fermentation, purification and product drying chambers. Apart from that, it has offices connected through a communication system with the area of production, storages for glassware, raw material and two 4 and -18 degrees Celsious chambers. All construction materials were asked according to the standards of the national and international biotechnological industry. Currently, there are 30 researchers, 40 fellows, 21 technicians and 3 administrative employees at the PROIMI. The new facilities at the institute are part of the work plans executed in Tucumán, within the Works Plan for Science and Technology of the province. So far, the investments for this Plan amounts to ARS$15,641,383. The event was attended by José Alperovich, the governor of Tucumán, and Juan Manzur, vice-governor of the same province; Javier Noguera, secretary of Innovation and Technological Development; Jesús Salim, province deputy; Leonardo Sánchez, researcher; and Paola Manfredini, doctoral fellow.